Supporting English Language Learners: What Happens When Teaching in Students’ Native Language is Made Illegal? Summary: This inspiring story of Floris Wilma Ortiz-Marrero, a teacher-consultant with the Western Massachusetts Writing Project and 2011 Massachusetts Teacher of the Year, describes how she became a vocal advocate for her ELL students in a time when the state made it illegal to teach students in their native language. In addition Ortiz-Marrero’s story, there are several important resources referenced and linked within the article. This article and the related resources would be a great starting point for teacher discussion groups focused on the ethics of ELL and/or bilingual education and legislation. 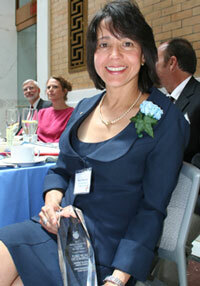 Floris Wilma Ortiz-Marrero is the first ELL teacher to win the state’s teacher of the year award. “She told me I’ll be a doctor or astronaut or—both,” said 13-year-old Takuto Kimura at a June ceremony in Boston honoring Floris Wilma Ortiz-Marrero as the Massachusetts 2011 Teacher of the Year, the first ELL teacher to receive that recognition. The young Kimura, who now speaks English with confidence, arrived from Japan three years ago in Ortiz-Marrero’s classroom at Amherst Regional Middle School not knowing a word of the language of his new country. It was at the Western Massachusetts Writing Project invitational summer institute that Ortiz-Marrero, who is from Puerto Rico, met the woman who was to become her colleague in many projects, Karen Sumaryono. To a degree these programs were the product of necessity. In 2002, Massachusetts passed the English for the Children ballot initiative that made it illegal to teach children in their native language. “Students who had not mastered English were coming into mainstream classes much sooner,” says Penniman. So Ortiz-Marrero, working with colleagues at Western Massachusetts Writing Project, began to develop workshops to help teachers who were new to the experience of teaching Russian, Ethiopian, Cambodian, and Puerto Rican immigrants with limited English proficiency (for more, see ELL Professional Development Adapts to New Bilingual Education Legislation). Much of what she taught teachers wasn’t complicated. She encouraged them to speak slowly, paraphrase confusing material, and allow groups of students to draw pictures to illustrate new vocabulary words. But she also found creative ways for students to use their first language in her classroom. For instance, she encouraged them to use their native languages when prewriting. She also understood the importance of encouraging students to preserve their cultural identity as they are learning in English. In an article she and Sumaryono published in the May 2004 edition of Voices from the Middle, Preserving the Cultural Identity of the English Language Learner, she describes a mini-geography lesson in which students point to their country of origin on a world map. She also suggests teachers honor first languages by using different languages to illuminate key words in a lesson. She knows that working with ELL students is a challenge for both the student and teacher. In working with English-speaking teachers she will present—all in good humor—an entire science lesson in Spanish, helping the teachers better experience what their students are going through as they make the effort to grasp their lessons in a tongue foreign to them. But in receiving the Teacher of the Year recognition, Ortiz-Marrero was being honored as much for her character as for her innovative ideas. Words like these support Penniman’s claim that Ortiz-Marrero “has been known to speak truth to power, but always in a respectful way.” She admits to being an emotional person who occasionally needs to curb her enthusiasm to be effective.